For a few dollars every month, you can get your own phone numbers anywhere in the world and track your incoming phone call leads. But did you know that you can also use your SeoSamba phone number to send SMS notifications to your website visitors and your sales team? When and why using SMS notifications? Get the details of incoming form requests via SMS. Your sales team gets notified immediately and can respond faster this way straight from their smartphone. A must for sole proprietor, and professionals working in the field. You're spending marketing dollars to bring folks to your website, but have you ever misplaced or overlooked that critical email lead you paid so much for? or simply not realized that your forms email were misconfigured or that your email server had some hiccups? We've been in business for nearly a decade and we've seen it all. Take our word for it, having that info via a 2nd channel other than email is best practice. Your visitor can also receive a notification on their phone with a confirmation message as soon as they sent you a message via your website. Our E-commerce SMS integration service lets you notify automatically store buyers when their orders are received and/or are shipped out, and more. Open your forms, and simply check a box in your edit form properties and add a phone number for internal notification. 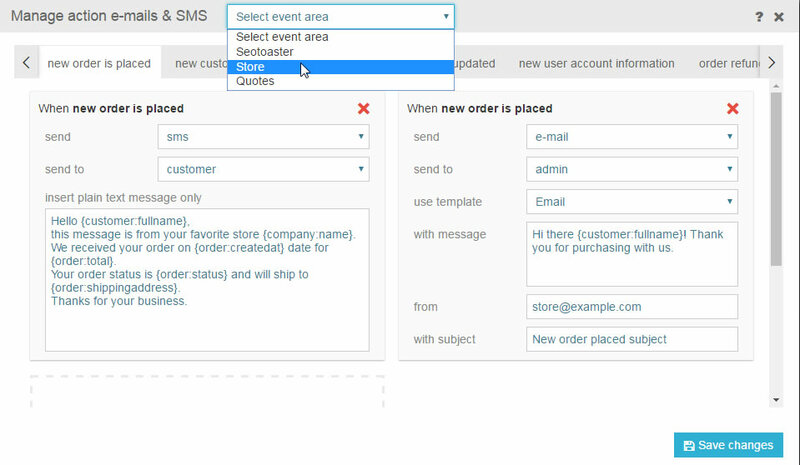 For SeoToaster E-commerce users, go to "Action Email & SMS" menu to configure both your email and SMS messages. Social Marketing Calendar & Publishing SeoSamba's social marketing calendar and publishing tools let you schedule social posts across any number of professional and personal accounts on major platforms such as Facebook, Twitter, and LinkedIn. View an entire month worth of past and upcoming social posts, or dig further to get more details with weekly and daily views. Content & Social Curation Quickly build your social presence and increase your audience's size by reposting great content from highly respected news, magazines, and blogs sources. Add your own sources or take advantage of our predefined channels such as Business, Medical, Eye candies, Insurance, Legal, People etc... Click, comment, and post to your social calendar. That easy. Website Analytics SeoSamba's analytics goes well beyond traditional web analytics, providing multisites stats at a glance, full ecommerce dashboard, deep SEO reports as well as social network analytics. All of it 100% customizable, plus on-demand white label for web agencies and SEO consultants. Lead Tracking Software Get 1 or more local or toll-free number anywhere in the world, and start tracking return on investment on your marketing. Get inbound caller ID, conversations record, contact form content, store sales, everything is aggregated in your dashboard. 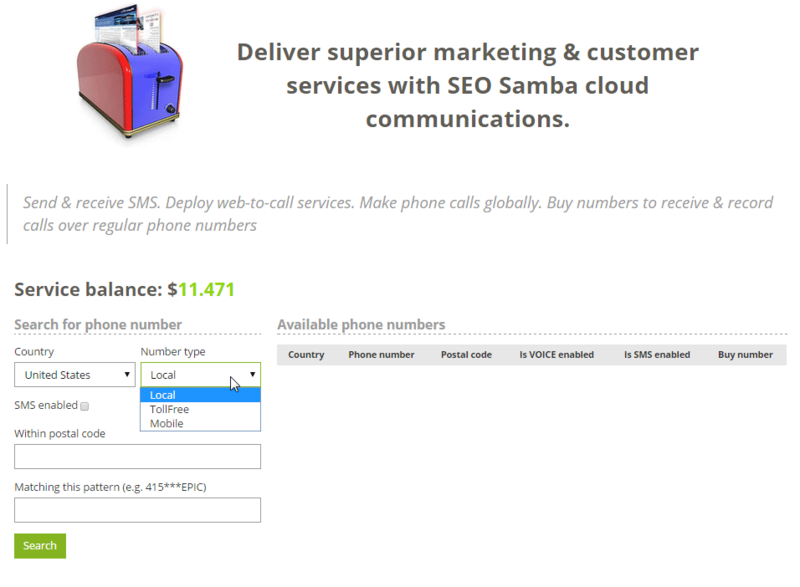 SMS Integration Use your SeoSamba phone number to also send SMS at critical times; folks contacting you via your website's forms get SMS confirmations while you can also get the details of their requests via SMS. Notify automatically store buyers when their orders are received or are shipped out, and more. Multisite Marketing Software SeoSamba's unique cloud marketing automation approach is a dream come true for multi-websites operators. Whether you operate lead generation websites, directories, or e-commerce stores, our multisite marketing software is the answer to all your needs. Search Ranking Tools With a premium SeoSamba subscription, you have access to detailed search engine rankings reports and reliably assess actual results of your SEO efforts for all your websites and from one single point of access: you centralized online marketing platform. PR & News Distribution Our PR distribution service ensures that your business reaches out to thousands of newsmakers, content aggregators, journalists, specialized bloggers and major print media newsrooms all over the world.